The World's Largest Bourbon Festival, Bourbon & Beyond, will make its anticipated return to Louisville, KY on Friday, September 20, Saturday, September 21, and Sunday, September 22, expanding to three days full of incredible music, unique culinary events, and unmatched experiences from the region's best distilleries at the new Highland Festival Grounds At KY Expo Center. 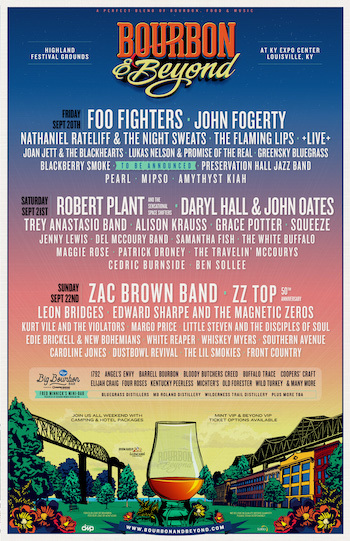 In addition to an unforgettable lineup of bourbon and chefs, music performers include a unique mix of rock, roots, bluegrass and folk acts headlined by Foo Fighters, Robert Plant And The Sensational Space Shifters (returning after originally being scheduled to appear in 2018), the Zac Brown Band, John Fogerty, Daryl Hall & John Oates, and ZZ Top (celebrating their 50th anniversary in 2019). Additional acts include Nathaniel Rateliff & The Night Sweats, Trey Anastasio Band, Leon Bridges, The Flaming Lips, Alison Krauss, Edward Sharpe And The Magnetic Zeroes, +LIVE+, Grace Potter, Little Steven & The Disciples Of Soul, and Joan Jett & The Blackhearts, among many others. In total, more than 45 artists will play on three stages, including the side-by-side Oak and Barrel main stages and a bluegrass stage that will be curated by the genre's leading authority, The Bluegrass Situation. Held during Bourbon Heritage Month, Bourbon & Beyond also celebrates the craftsmanship behind award-winning spirits, master distillers and world-class chefs. Bourbon author, Amazon Prime host (Bourbon Up) and expert Fred Minnick has curated one-of-a-kind tastings and seminars celebrating Louisville's world-renowned distilleries, while culinary curators Edward Lee (The Mind of A Chef) and Anthony Lamas (Seviche) will team up to arrange special food experiences that will be announced soon. "If you could capture America in a bottle, it would be a bottle of bourbon. It's a uniquely American creation, like jazz and baseball, and its beating heart is in Louisville," says Bourbon & Beyond producer Danny Wimmer. "This connection to the past has transformed Louisville into a city of the future. One of the most vibrant and diverse food scenes in the country has grown around bourbon's resurgence, and we tried to mirror that spirit with the great music lineup that we put together. I can't wait for people to visit this city in September and experience something that goes far beyond their preconception of what Louisville is." Bourbon & Beyond exclusive VIP packages, General Admission tickets, camping and hotel packages, as well as special event tickets, go on sale Friday, March 15 at 12:00 PM EDT. Visit www.BourbonandBeyond.com for more details. Produced by premier independent festival producer Danny Wimmer Presents, the third annual Bourbon & Beyond will be held at a new festival location, the Highland Festival Grounds At KY Expo Center. All of DWP's Louisville festivals will take place at the new venue, including the first-ever Hometown Rising Country Music & Bourbon Festival (Sept. 14-15) and Louder Than Life (Sept. 27-29). Fans interested in attending all three weekends can purchase a special Trifesta Pass, which allows General Admission weekend access for the discounted rate of only $229.00 plus fees. Visit https://trifestapass.com for more information. The festival's centerpiece, Kroger's Big Bourbon Bar presented by Louisville Courier Journal, will feature more than two dozen hand-selected bourbons from top distilleries, and a unique opportunity to enjoy bourbons and exclusive one-time specialty cocktails from 1792, Angel's Envy, Barrell Bourbon, Bloody Butcher's Creed, Buffalo Trace, Coopers' Craft, Elijah Craig, Four Roses, Kentucky Peerless, Michter's, Old Forester, StoneHammer, Wild Turkey and more to be announced. As part of this innovative partnership and Kroger's commitment to Zero Hunger | Zero Waste, 25 cents will be donated directly to Dare to Care Food Bank (www.daretocare.org) from every ticket sold. Dare to Care Food Bank works to ensure that no one in our community lacks enough food to live an active, healthy lifestyle, and Kroger's Zero Hunger | Zero Waste initiative is their bold plan to end hunger in our communities and eliminate waste in their company by 2025. Fred Minnick's Mini Bar presented by the Bourbon Women Association will showcase craft selections from Wilderness Trail, MB Roland and Bluegrass Distillery. Acclaimed Louisville whiskey bar The Silver Dollar will operate The Hunter's Club, where attendees can find vintage bourbons dating as far back as the 1930s, as well as contemporary collectibles. 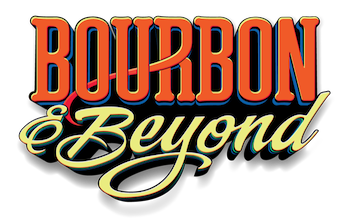 The initial list of participating bourbon brands at Bourbon & Beyond includes 1792, Angel's Envy, Bardstown Bourbon, Barrell Bourbon, Blanton's, Bloody Butcher's Creed, Bluegrass Distillery, Boone County Distilling, Buffalo Trace, Coopers' Craft, Elijah Craig, Evan Williams, Four Roses, Jim Beam, Kentucky Peerless, Knob Creek, Larceny, Maker's Mark, MB Roland, Michter's, Old Forester, Wild Turkey, Wilderness Trail, W.L. Weller and Woodford Reserve. Whiskey sponsors also include Jack Daniel's, High West Distillery, Uncle Nearest and Southern Comfort. In addition, attendees can enjoy a variety of local and regional food and beverage offerings provided by DWP's affiliate concessionaire, Southern Hospitality Concessions LLC. Festival attendees will be able to experience a taste of Louisville with selections from the following local and regional restaurants: Boss Hog BBQ, Couvillion, Doc Crow's Southern Smokehouse & Raw Bar, Ehrler's Ice Cream, Eli's BBQ, Heine Brothers Coffee, Hull And Highwater, Joella's Hot Chicken, Merle's Whiskey Kitchen, Sarino, Seviche, and more. Beyond VIP tickets include access to all Mint Experience VIP amenities PLUS a shaded viewing deck, air-conditioned lounge/tent with live audio/video streams of the Barrel and Oak Stages, all-inclusive premium drinks at 2 private bars within the hang area, complimentary hors d'oeuvres during set lunch and dinner hours, dedicated air-conditioned, flushable bathrooms, massage station, complimentary lockers with cell-phone chargers, complimentary Wi-Fi access, Beyond VIP Concierge staff and a commemorative Beyond VIP laminate and wristband. Bourbon & Beyond sponsors include Kentucky Department of Tourism, Louisville Tourism, Kroger, Lagunitas, Red Bull, Zyn, Fxck Cancer, Tito's Handmade Vodka, Angry Orchard, Bourbon Women Association, Kentucky Distillers' Association (KDA), Glencairn Crystal, and Eagle Nest Outfitters. After serving in Iraq in 2004, Wall Street Journal-bestselling author Fred Minnick found a new home in bourbon. Today, he's the editor-in-chief of Bourbon+ Magazine and star of the Amazon Prime show Bourbon Up. Since 2006, Minnick's covered bourbon for the New York Times, Scientific American, USA Today, Whisky Advocate, Whisky Magazine and many more. He's written seven books, including Whiskey Women, Bourbon Curious and the 2017 Spirited Winner for World's Best Spirits Book, Bourbon: The Rise, Fall & Rebirth of An American Whiskey. He serves as the official bourbon curator for Bourbon & Beyond and is the Bourbon Authority for the Kentucky Derby Museum. Learn more at FredMinnick.com.